A very handsome change of pace from the golden barrel. 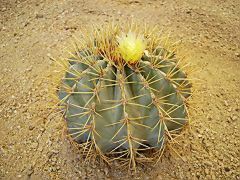 Ferocactus glaucesens has the beautiful golden spination with a light blue body. They do not take our summer sun very well so need a location with some afternoon shade. Given a small resprite from full sun, they are as pretty in the landscape as any plant you could choose. As a show plant in a pot, they are a winner with the blue/gold combination that is unlike anything else. The stunning contrast combined with near perfect symmetry make this plant a winner in any situation. Ours are mature flowering plants. 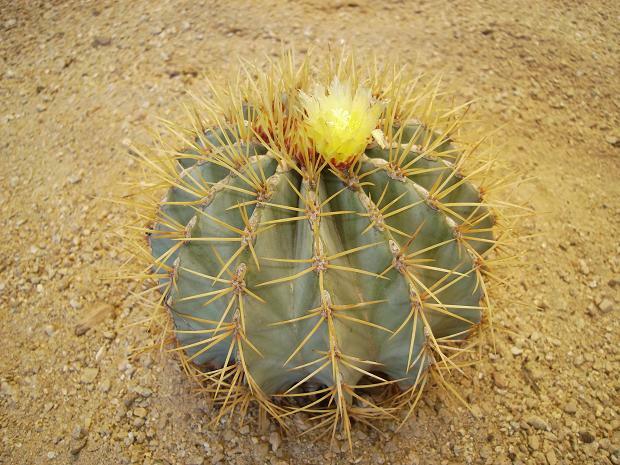 Their bluish skin with yellow blooms present a unique combination in the barrel family. They have very minor scarring deep in the seams of their ribs as do every large F. glaucescens I have ever seen. This scarring is much too small to show in our photos and is not really visible except at extremely close range. This species tends to add offsets at about this size so you could easily end with a mult-headed specimen in coming seasons.